Now with Pokémon inspired Stickers & Frames! Back in Time with Famicam 64: the Ultimate Gaming Camera! With +50 LIVE Filters and Frames inspired by the look of the most iconic Computers and video games, Famicam 64 allows you to capture the most amazing 8-bit pictures ever. 4. FRAMES: to turn your photos into​ old game covers, vintage CRT screen or even a screenshot straight from Minecraft or Pokémon! If you grew up blowing into cartridges, or loading games from floppies (…or even through a tape recorder) and you’re feeling nostalgic… or just love the fantastic pixelated aesthetics and colors of the era, this is the app you can’t miss. 1. More than 50 non-destructive LIVE filters, with fully adjustable custom parameters, inspired by the most iconic retro computers, consoles, and video games… From “Tennis for Two” oscilloscope experiments and text-based adventures to the last home computers and handheld consoles (and much more!). 2. Drawing module to pixel-sketch your photo with different colors, effects, retro brushes, color selector and picker. 3. +350 8-bit Sprites, divided into categories (emoticons, monsters, weapons, objects, etc.) 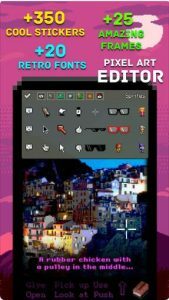 to enhance your image and create awesome retro-gaming visual stories to share with your friends. 4. Awesome Custom Frames simulating retro game covers, magazines, floppy, cartridges or CRT screens. Be proud of the origins of computing… Get Famicam 64 Today and re-start the 8bit revolution! …Instagram gave us the notion that filters are cool, but Zuck’s photo app nowhere near as cool as the Famicam64 app. … Famicam 64 allows you to easily capture great looking 8-bit pictures. The Famicam64 ultimately is a fun alternative to Instagram for the retro gamer, wanting to send pictures which reflect the era of gaming they love, with lots of built in winks and nods to classic gaming, and plenty of options which allow you to give all of your snaps a fun, geeky overlay. If you’re a gamer, what are you waiting for? The Ultimate 8-bit Retro Camera…Forget about looking for the latest and greatest camera app for your smartphone, as you can now have a cool 8-bit retro camera suite with real-time effects, pixel art editor, ​and sprites!